The other rows are what happens when we want to build native (or “hybrid”) apps for specific platforms. This lets us use libraries or modules which are native to those platforms to extend the capabilities of AppStudio. Here, the chart breaks into two sides. The left targets the mobile operating systems of iOS and Android. AppStudio uses the Cordova Plugins library: there are current over 4300 modules listed. PhoneGap Build is the easiest way to package your AppStudio and Cordova Plugins into an executable which can be distributed to Android and iOS devices, including through their respective app stores. The right hand side of the chart targets Windows, MacOS and Linux. Nodejs modules can be included in your AppStudio project. The npm repository currently lists over 900,000 modules. 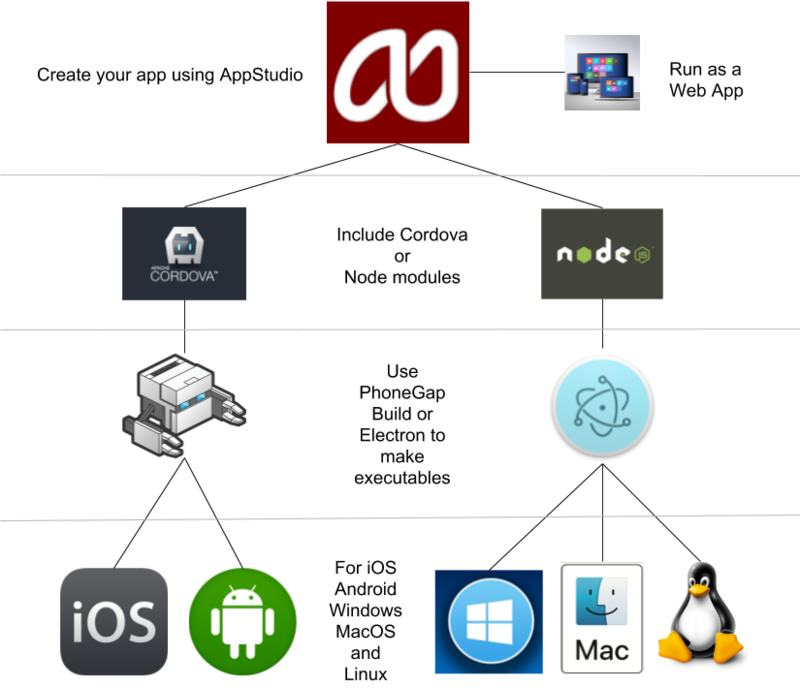 Electron is used to package the AppStudio and Nodejs modules into native executables. These executables can be used to install all the files which are needed for your AppStudio app to run on the targeted operating system. The result is that you can write an app once in AppStudio and deploy it to the five most common operating systems. Previous PostPrevious AppStudio 7.3.0 released! Next PostNext Our website is now www.appstudio.dev!